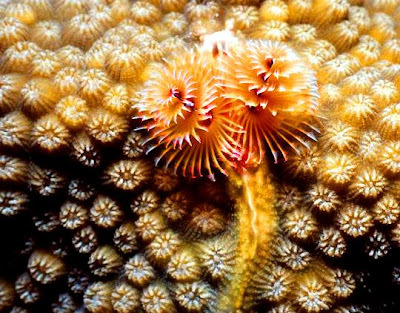 A tangled wonder of the reef seascape. 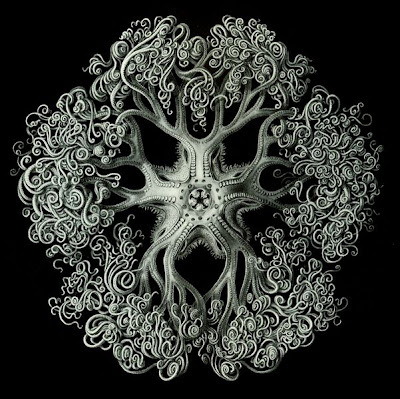 The giant basket star (astrophyton muricatum) is a marine invertebrate found in the shallow waters of the Caribbean seas, often around British Virgin Islands. It is believed to be early Mesosoic in origin. 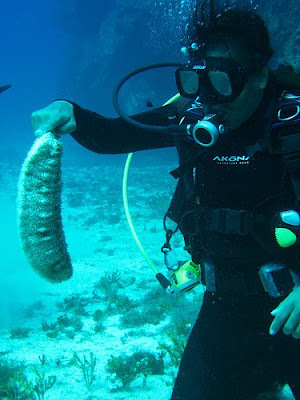 The furry sea cucumber (astichopus multifidus) can be seen crawling or rolling over the sea floor of the Caribbean, Bahamas, and Florida. 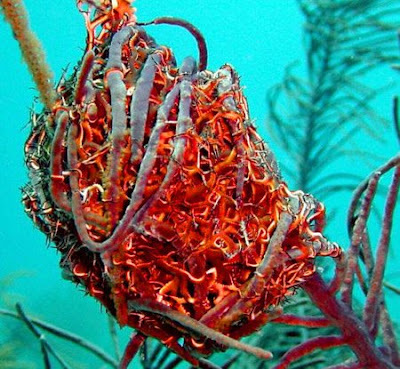 Like other echinoderms (radially symmetrical animals that are only found in the sea), the furry sea cucumber can re-grow, or regenerate its body tissues, that have been damaged, injured, or lost. 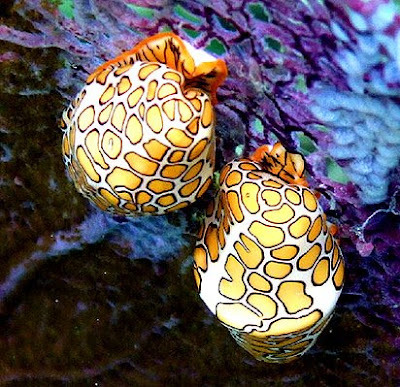 The flamingo tongue snail (cyphoma gibbosumn) is a small, colorful sea snail which lives on various species of soft corals in the tropical waters of the western Atlantic Ocean, including the Caribbean Sea. 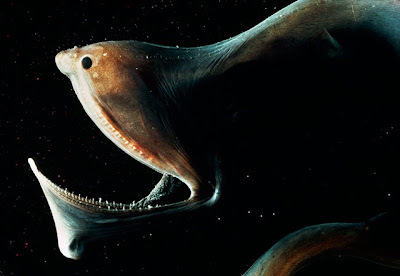 The umbrella mouth gulper eel (eurypharynx pelecanoides) can be found mostly in eastern and central Pacific Ocean at depths ranging from 900 to 8,000m (3,000 to 27,000ft). 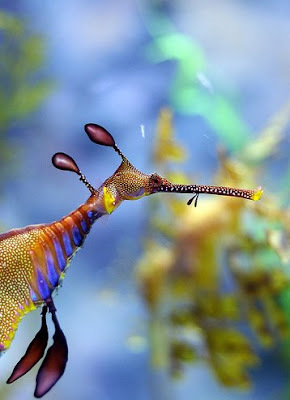 Its enormous mouth can be opened to pelican-like proportion to enable it to feed on preys that are much larger than its size. The tip of its tail emits light, attracting prey about to be spectacularly swallowed up. They know what you did last summer. 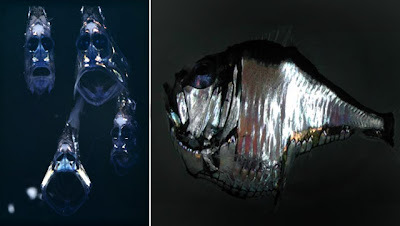 A hatchetfish has extremely thin body, resembling the blade of a hatchet, and tubular large eyes that are permanently fixed looking upwards - to enable them to search for food falling from above. 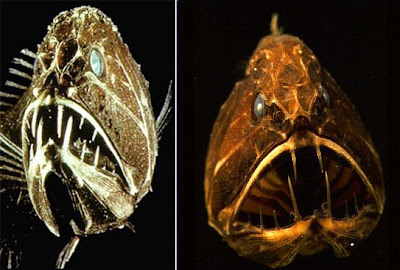 Hatchetfish are found in most temperate waters at depths of 200 to 6,000m. 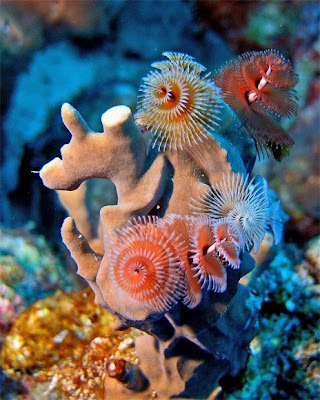 The christmas-tree worm (spirobranchus giganteus) is a small polychaete worm most often found in the Black Forest Reef and other reefs near Grand Turk. This squid sees the world in color. 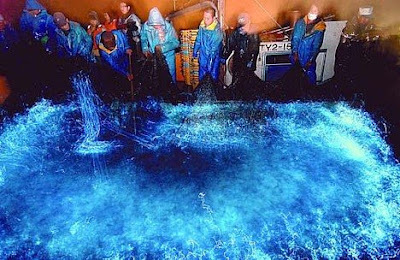 And it makes deep-blue pretty light itself. 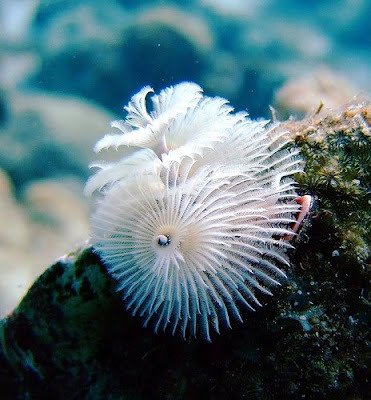 It’s equipped with special deep-blue light producing organs called photophores - by flashing the lights on and off, it can attract its prey before pouncing on them with its powerful tentacles. 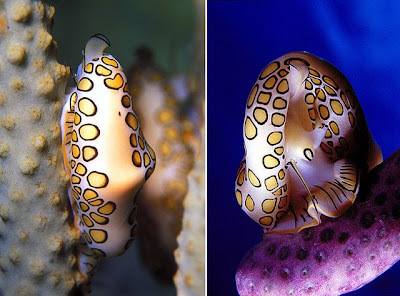 It’s also only cephalopod species which have color vision! 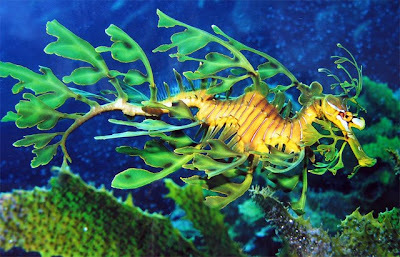 Now we come to the section featuring deep sea beauties. 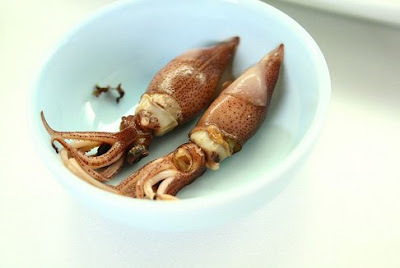 Hold on to your breakfast, these guys are uglier than the current American stock market situation. 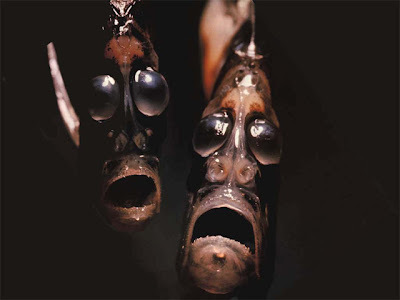 The viperfish (chauliodus sloani) is one of the most ferocious and unusual-looking deep-sea creatures found in tropical and temperate waters world-wide at depths of up to 2,800m (9,000ft). Are you ready for another nauseating shot? We warned you… Here is an angler fish - with its stomach in its mouth (decompression caused the stomach to invert). 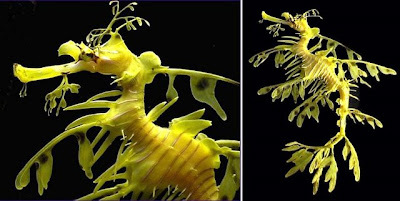 Winner of the Deep Abyss Beauty Contest last year. 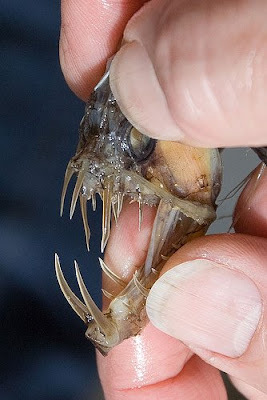 A Fangtooth (anoplogaster cornuta), or ogrefish, dwells in tropical and cold-temperate marine water worldwide, particularly the waters off the coast of Australia… the waters off Australia seem to teem with all kinds of monsters. 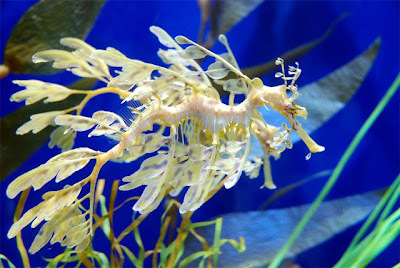 It may be ferocious-looking, but it’s actually quite small - a maximum length of 17cm.